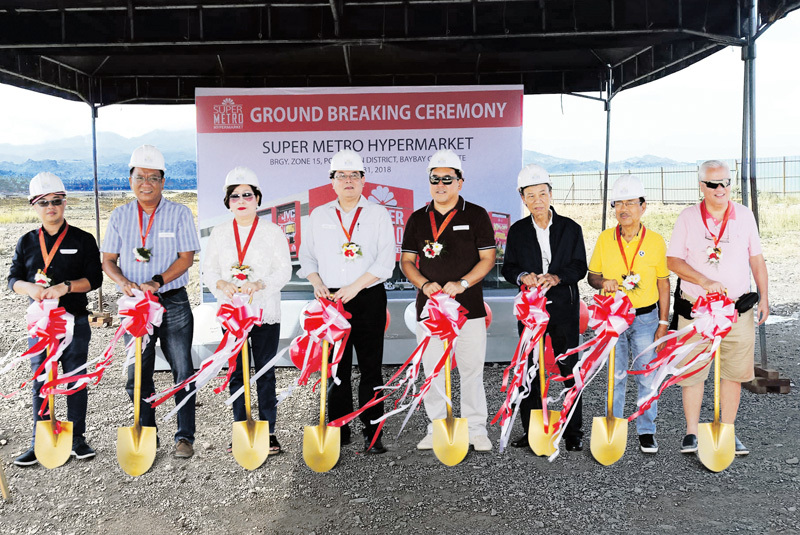 Metro Retail Stores Group, Inc. (MRSGI) recently broke ground for Super Metro Hypermarket in Baybay, Leyte. The new store is expected to strengthen MRSGI’s business foothold in the Visayas region as the city of Baybay is an emerging economic hub. For residents there, the establishment of the facility is good news as it gives access to a wide assortment of grocery items, basic essentials, fresh produce, and quality merchandise at affordable prices. MRSGI now operates in 51 stores in central, western and eastern Visayas as well as in Central Luzon, Metro Manila, and South Luzon, with three store formats comprising a department store, a supermarket and a hypermarket. At the event were (from left to right): Clifford Garcia, MRSGI real estate head; Benedict Miranda, VP-land and space; Hon. Carmen Loreto, Mayor of Baybay City; Arnold Leoncio, VP-head of network expansion, Hon. Michael Loreto, vice-mayor of Baybay City; Hon. Leoncio P. Asilom Jr., Hon. Dominador Murillo, and Hon. Vicente G. Veloso, sangguniang panlungsod members.